Asscher cut diamonds are a very distinctive, stylish cut from the emerald cut diamond family. The term “Asscher” cut is the name we use for this diamond. However this is not the name that the GIA and other labs use on the diamond grading certificate. The cut is referred to as a “Square Emerald Cut”. This is the correct name, as the asscher cut diamond is a variant of the emerald cut diamond. Proportions of Asscher cut diamonds. Emerald cut diamonds with equal length and width to the eye are called Asscher cut diamonds. 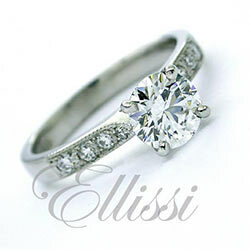 This gives the diamond a generally square shape. They have the trademark angled corners you will see in emerald cut diamonds. They also have the beveled corners to the crown and rear portion of the stone. As with all diamonds of “fancy cut”, Asscher cuts can vary in some major ways from one diamond to the next. Deeper cut stones with a high crowns or shallower cuts with lower crown angles are all possible. The table diameter and width of corner faceting can also vary markedly in Asscher cut diamonds. The visual effect of the rear corner facets is one of the unique features of this cut. This creates a shape similar to the sails of a windmill within the diamond when viewed through the top. Selection of Asscher Cut Diamonds. When selecting Asscher cut diamonds, there can be a little leeway in some areas of diamond selection, but we apply tighter criteria in other areas. A little flexibility in regard to cut is possible. This is because for lovers of the Asscher cut, it is the clean glassy geometric look that is appealing. People who prefer this cut to others are less interested in the sparkle associated with other diamond cuts. Clarity is an area that should be given very careful attention. Although the grading of Asscher Cut diamonds is pretty much the same as for other diamond types, the nature of this cut should be considered when thinking about clarity grades. It has a clean, clear look that acts like a window through the diamond. This gives the diamond almost no ability to mask inclusions. So clarity grades that would be perfectly acceptable in a more faceted cut type are far less desirable in Asscher cut diamonds. For more info on what we look out for in both emerald and asscher cut diamonds, please click on the following link: Emerald cut diamonds. The Asscher cut is a diamond that people love precisely because it is not as sparkly as most other diamond cuts. For me it is one of the more unique diamond choices, especially when combined with round brilliant cut diamonds in a halo design. The contrast in the two styles of cut makes a stunning combination. Only the individual can decide if this is the right cut for them. The unique stlye of the asscher cut really makes for a stand-out ring. Click on this link for some of our favourite Asscher cut ring designs.